In a skillet over medium heat, melt butter. Peel and crush garlic, add garlic, snow peas, and sea salt to the melted butter. Keep on medium heat, and stir every minute or so for 5 minutes, or until peas just start to turn bright green. Remove from heat and serve, peas will continue to cook a bit even after you remove them from heat. 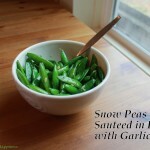 The key to these snow peas being good the next day too is to not overcook.